I bought a large hake yesterday, from the fishmonger in Chapel Market. I saw hake throats being cooked in a San Sebastián food club, on Rick Stein’s Spain (BBC 2 television) two weeks ago. Having a hake with head and knowing that the throat is a delicacy, I thought I should cook it. There was no recipe in the TV programme and almost nothing on the web, so I went by what I’d seen. Chopped garlic, red chilli pepper and olive oil. 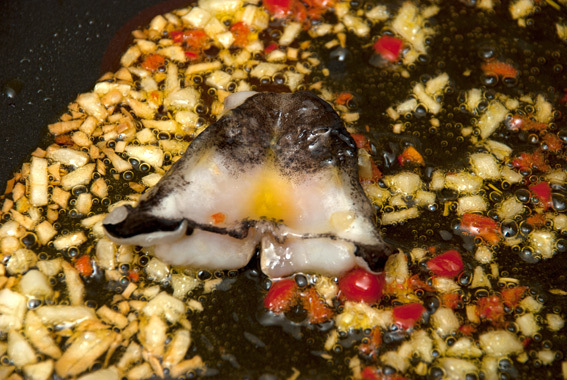 I used half a chilli and 3 pieces of garlic (chopped finely) – I fried the throat for a couple of minute per side. It tasted quite delicate and fluffy, a bit like the texture of calf’s brains. Apparently hake throat, something which was once discarded, now goes for as much as €70 per kilo in Spain! Incidentally, the throat is the underside to the mouth (it would be just under the jaw on a human). It’s all flesh, no bones and you trim it off with a sharp fish knife. 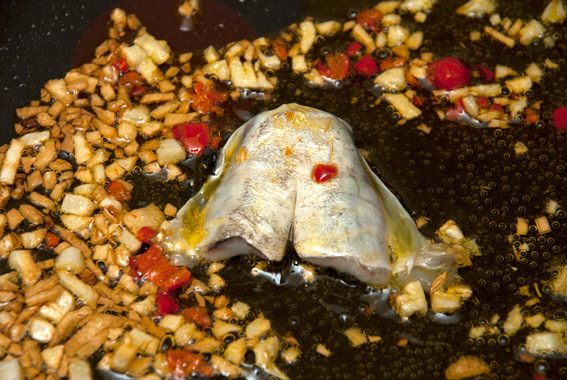 This entry was posted in Fish, Food, Meat, Recipes, Shopping, Spanish and tagged Angel Fisheries, calves brain, chilli, fish, garlic, hake, hake throat, olive oil, Rick Stein, Spain. Bookmark the permalink. 70 bloody euros a kilo!!!???!!! No wonder the buggers at the market don’t put the heads in unless you ask. When I lived in Spain, people always wanted the head for stock – it’s also very good for flavouring beans and potatoes. Interesting …mmmm! Whenever I cook fish with garlic I am always sorry as it overpowers the delicate fish flavours … but I see you add chilli as well as garlic… does the hake take it on the chin, or are you drowning out the flavour of fish deliberately ? Well, you taught me something new today, MD. Hake throat. Who knew?